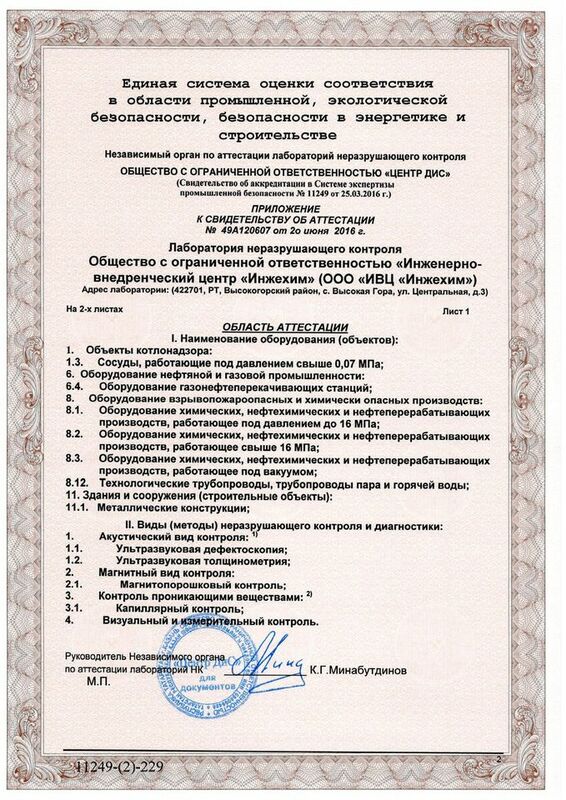 EPC “Ingehim” (EPC “Inzhekhim”, as in some older unofficial documents and affiliations in scientific publications of our employees) possesses a laboratory of non-destructive testing and technical diagnosis created for the purpose of systems integration in the fields of control over product quality and industrial safety systems. The laboratory contains equipment that meets the most up-to-date requirements in the quality control and technical diagnosis: devices for visual control and measurement (fiber-optical endoscope combined with digital camera), ultrasound devices (ultrasonic flaw detector A-1212, ultrasonic thickness gage), viscosimeter VZ-4 and hardness meter MET-UD. 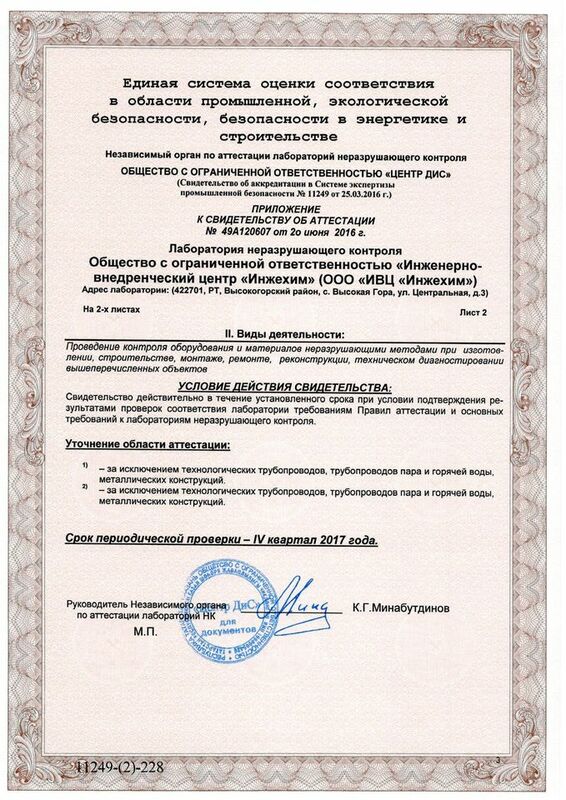 A Certificate of Attestation was awarded to our laboratory by “Center DIS”, Ltd., Kazan, Russia, granting permission to perform technical diagnosis of equipment of chemical, petrochemical and oil refing plants using non-destructive testing methods. Major area of activity of our laboratory is testing equipment and materials using non-destructive testing methods during manufacturing, installation and redesigning of equipment. 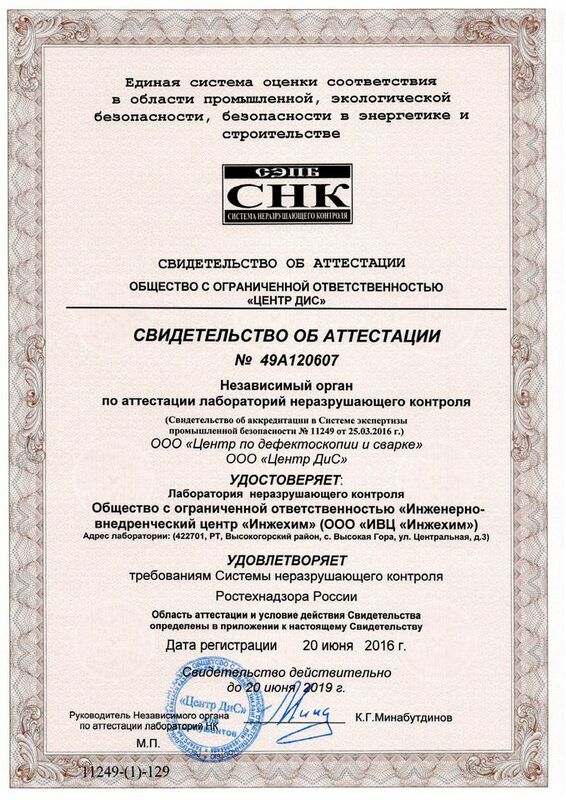 Quality control is carried out by our highly-trained specialists holding certificates granting permission to perform testing using several non-destructive testing methods. They periodically receive refresher training in special evaluation centers.